The Aleppo Pine commemorates those who served in World War One. THIS ALEPPO PINE (PINUS HALEPENSIS) TREE WAS PLANTED ON THE 25TH APRIL 2016. 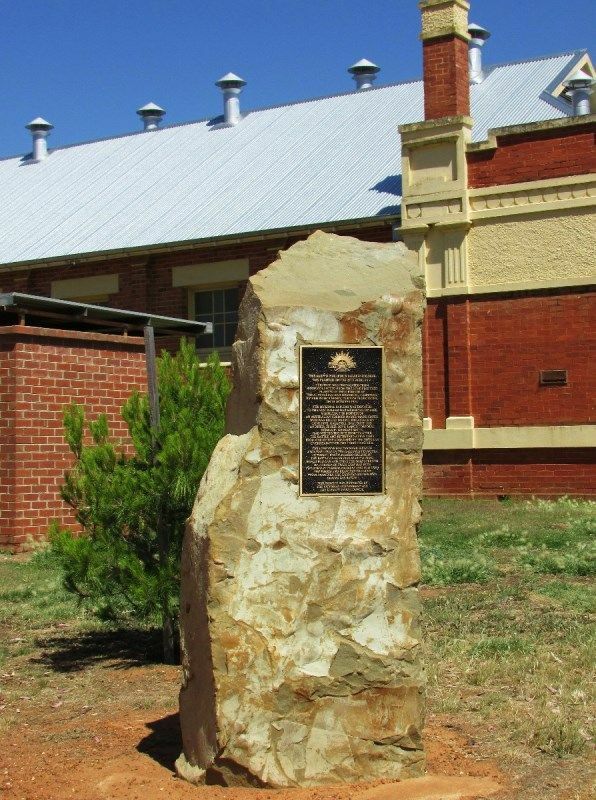 THIS TREE WAS PROPOGATED FROM SEEDS COLLECTED FROM THE LONE PINE TREE PLANTED IN THE GROUNDS OF THE AUSTRALIAN WAR MEMORIAL, CANBERRA BY HIS HRH PRINCE HENRY, DUKE OF GLOUCESTER, ON 24TH OCTOBER 1914. THE ORIGINAL SAPLING WAS DONATED TO THE AUSTRALIAN WAR MEMORIAL BY JANE McMULLIN, THE MOTHER OF AN AUSTRALIAN SOLDIER NAMED MARK SMITH WHO WAS KILLED DURING THE ATTACK ON LONE PINE, GALLIPOLI, IN AUGUST 1915. ANOTHER OF HER SONS LANCE CORPORAL BENJAMIN CHARLES SMITH, HAD VISITED THE SITE SHORTLY AFTER THE BATTLE AND RETRIEVED A PINE CONE FROM ONE OF THE LOGS USED BY THE TURKS AS OVERHEAD COVER FOR THEIR TRENCHES. 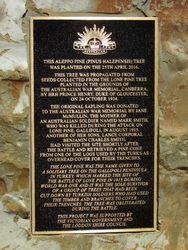 THE LONE PINE TREE WAS THE NAME GIVEN TO A SOLITARY TREE ON THE GALLIPOLI PENINSULA IN TURKEY, WHICH MARKED THE SITE OF THE BATTLE OF LONE PINE IN 1915 DURING WORLD WAR ONE AND IT WAS THE SOLE SURVIVOR OF A GROUP OF TREES THAT HAD BEEN CUT DOWN BY TURKISH SOLDIERS WHO HAD USED THE TIMBER AND BRANCHES TO COVER THEIR TRENCHES. THE TREE WAS OBLITERATED DURING THE BATTLE.